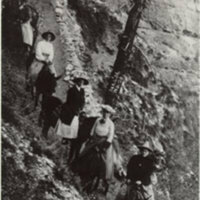 Florence Bascom, geologist, and other women on Grand Canyon expedition, 1906. 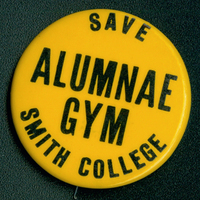 Save Alumnae Gym pin, 1976. Round yellow pin with the words "Save Alumnae Gym Smith College" printed in dark ink. Photograph of exterior, front of Library showing closed wooden doors and ivy on the building. 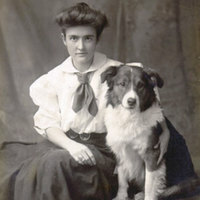 Head and shoulders portrait of college librarian Josephine Clark as a Smith student. 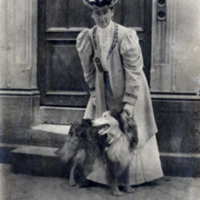 Mary Dunham, Smith College Librarian. Head and shoulders portrait of Mary Dunham, who was the Smith College Librarian from 1920 through 1942. College Librarian Margaret Johnson with model for 1962 Neilson Library building addition. Black and white photograph of Margaret Johnson looking at architectural model. Portrait of College Librarian Margaret Johnson, undated. Head and shoulders portrait of Margaret Johnson.